I’m going to be moving this year, back to my old house. I like this little rental house where I am, but my personal life has had a change of course and my wife and I will once again be living as, well, husband and wife. So, what does this mean for this casual homesteader? First, it makes absolutely no sense to plant a garden where I am now. However, I do need to till the area up and replant it to grass for the next tenant to enjoy. Maybe the new tenants would like to have a garden, but it will be halfway through the summer before they move in and I am more inclined to leave things as I found them, rather than leaving a bare plot of tilled up ground. Then again, as we all know, if you leave a plot of tilled ground bare, it doesn’t stay that way for long. Without having planted a garden last year I wound up having to mow it. So is it the end of the garden? Nope. I had a garden before at the old house and my wife is chomping at the bit to have one this year. There will be a lot of work to get it ready, though, as there are many small, weedy trees that have grown up around the outside of the garden over the years. Too much shade for a garden, so they have to go. I guess the garden is in as bad a shape as I am. We’ll see which one of us prevails, but at least I have my wife as an ally in this war. I have more space and less risk of people messing with the garden where I am now. For the new garden it would really be nice if we could put a tall fence at least across the back of the property. I’ll have to see if the budget will bear that burden. Moving alone is not going to be cheap. In reality, I really wish that we could buy a house out of the city with a good space for a garden, but financially that ain’t gonna happen. Oh well. At least there is space for a garden. I’ll have to take some pictures as we get along with that project. So what’s the first order of business for this new/old garden? For Valentine’s Day I took my wife to the store to buy whatever seeds she wanted, so we are off to a start there. She even bought seeds to start tomato plants. I have not had great success with that lately and would be more likely to just buy plants, but what the heck, we’ll give it a go. We can always fall back to buying the plants. We should start those plants in a few weeks, so we need to set up an area for that. We’ll see if we can stick to that schedule. So that’s the new/old beginning. I’m looking forward to living with my wife once again, but not so much to all the work the place is going to need to whip the garden into shape (not to mention other parts of the old house that really need work). Thankfully, it’s not the acre garden that we once had, so I think we will be able to handle it. I’ll be following up with pictures in later posts. Wish us luck. Outside my window the snow is coming down pretty well right now. I don’t think there will be any accumulation, but there are definitely more than just a couple of flakes, such as the usual “first snow” is. We have had decent weather this fall. As recently as Saturday, the 12th, it was 70 degrees, but we have hit a cold patch. I sure hope we have some warmer days before December comes. I still have yard work to do. There isn’t anything unusual about these weather changes, but I wanted to make note of the first snow. I went to the Sandwich Fair today. It’s located in, oddly enough, Sandwich, Illinois. While it is technically the DeKalb County Fair, it is widely known as the Sandwich Fair. In fact, it wasn’t until I looked it up just now that I discovered it was the DeKalb County Fair, and I’ve not only been going there for years but have also entered a competition in the past. Yep, the fair has been around since 1888 – the oldest continuing fair in Illinois. It always takes place the week after the Labor Day weekend. That, in my humble opinion, is a great time for a county fair. When you have a fair in the middle of July you may not have been able to harvest some of the crops for which they hold competitions. You don’t have that problem at the beginning of September. This is a real county fair. It has competitions for home arts as already noted, and for crafts, photography, art, collections and all sorts of similar things. The main point of a county fair, though, is the produce and animals, and there is no shortage of those. Produce of every kind is entered into competitions, as well as things like flowers. Animals are the biggest draw, with goats, sheep, dairy, beef, pigs, rabbits and poultry. Almost every category has both a junior and open competition. 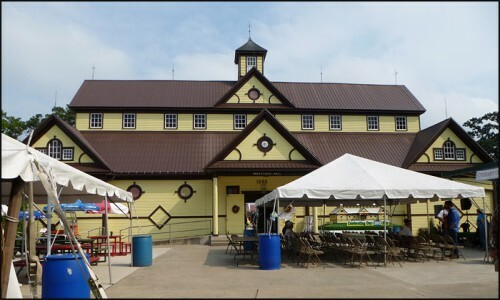 It’s a great place to bring the city kids to see real farm animals. Of course there are rides and so many things you can stuff your face with. All sorts of vendors are there, as well as farm equipment dealers and RV dealers. There are midway games to play, too, for young and old. I actually ran into my niece and her husband as their three young kids played a game simple enough for them to win. While I occasionally go to the fair, my brother and his family have made it a yearly tradition and his kids carry it on. My father-in-law even gets in on the act. He won a red ribbon (second place) for a wood carving he entered this year. The fair is a slice of country life. Just walking around and looking at things cost me $9.00 to get. If you enter a competition your general entry fee of $15.00 gets you an exhibitor’s pass which admits you for all five days of the fair. If you want to spend more money, then hit the food vendors and let the kids go wild on the rides. Then take in the shows in the grandstand for extra $$$. If you want, you can take advantage of special discounts on different days and at different times. My favorite things to see there? Well, I always have to check out the vegetable and home arts competitions. I like looking at the photography entries, too, and trying to figure out why in the world someone voted that entry a blue ribbon. I always like to see all the animals. As a frustrated, used-to-wanna-be small farmer, I enjoy them. And there’s nothing like going by a rooster’s cage when he lets off a cockadoodle-do right in your ear. It all makes me feel a bit more “country” than I really am. Last time I was there was in 2005, so it’s been a long time for me. Next year, if my brother and his wife go, I think I’ll tag along with them. It’s always nice to be able to go with someone else. So rustle up someone and come along. Next year it runs September 3 through 7 – here’s the link – Sandwich Fair. And no, I’m not paid to promote the fair. It’s just great family entertainment, unless, of course, you’re one of those jaded city folk. It is a beautiful weekend here. I’ll enjoy it, but only from the comfort of my bed or chair. Somehow I have managed to screw up my lower back and I can’t move without pain. It’s hard to do anything around the “homestead” when there is a risk that your legs will give out from the pain of doing nothing more than taking a step. Living in my suburban world this isn’t the problem it would be if I were living in the wilderness. When your life depends on being active every day, being laid up for a few days could be disastrous. It is the risk one assumes when living an independent lifestyle. While I know I will eventually recover, it is terribly inconvenient, and is a cautionary event that should make me rethink the way I do things. I am not sure exactly why my back is feeling this way, but I did pick green beans the other day and, I must confess, I do so by bending over at the waist. It was a fair amount of picking, and I had picked beans just the weekend before, too. The fact that I had to keep standing up and stretching to keep on picking should have told me I was pushing it. Then again, maybe it was the 50# sack of sunflower seeds that I had to lift into and out of the trunk of my car. Or maybe it’s that I’m just plain out of shape, or that this weight on the front of me is hard on the backside of me, or maybe just a combination of all these things. So, the idea of a roll-along seat that I can use while picking green beans is very appealing. Ideally I should do more squatting (lift with the legs) when working in the garden, but with these knees that would put me down for sure. Stretching and exercise is definitely called for. Take this as a warning to look at the way you do things, too, and look for ways to make things easier for you. You’re not less of a woman or man for doing so and might actually extend the number of years you can be active. It was the early 1970’s. My wife and I were newly married and trying to make a life of our own together. We started out living with my mother-in-law but when she remarried shortly thereafter it was time to strike out on our own. A cheap, too hot all year around with a guy across the hall constantly coughing like he was losing a lung, basic, concrete block apartment was next, which was then followed by a considerably more pricey apartment in a newly built complex. At the time we moved into the latest apartment I was working with a guy by the name of Bill Hardacre. He was living on a farm in a rented house that was once the farmhand’s house. The farm buildings were no longer being used and the fields were rented out. The old farmer lived in the main house on the property. I visited Bill in his house and was instantly envious. Plenty of elbow room and an actual house – not an apartment – and when he told me what he was paying for rent my envy doubled down. 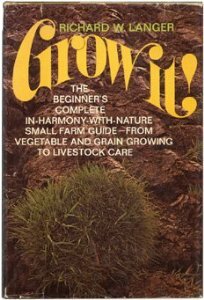 To make matters worse, Bill loaned me a book – Grow it!, by Richard Langer (apparently out of print now, and probably a bit dated anyways). This is what started it all. I was hooked. Homesteading was the way I wanted to go. Now all I needed was a place to do it, because it’s a little tough doing it in an apartment, or at least I thought so at the time. Timing is everything, and it wasn’t long before Bill and his wife bought a house of their own and through him my wife and I had an “in” to rent the house they were leaving. We jumped on the chance and soon found ourselves in an old, uninsulated, oil-heated, propane fueled farmhand house – and loved it. I have Bill to thank for my introduction to homesteading and for the place to do it. We lived in that house for ten years. Though the old memory is a bit foggy, I believe we gardened there every year we were there, having at one point in time enlarged the garden to an acre in size. I tried growing almost everything, and what I grew that I couldn’t eat right away, I canned. There were also a couple of old apple trees near the house that provided apples for apple jelly, apple butter and plenty of apple crisp. While we lived there we were constantly searching for a place to buy for our own small farm. That never came to pass, and looking at it from this point in time I know it was a good thing, because the reality is that I would never have had the self-discipline to make a real go of it. Instead, we moved into a house in the city. But out on that farm it was great! Sure, we had a really long driveway that I had to spend long frigid hours on my neighbor’s lawn tractor plowing, and the wind would blow through the house like there were no windows, and the ground near the side door would turn to nasty mush (we let the dogs out there) in the spring, and we would run out of propane repeatedly and not be able to cook or have hot water, but it was all the price we had to pay for a little bit of heaven. It was the start of my homesteading state of mind, and though time has probably improved my memories of the place, I wouldn’t be the person I am today if it were not for that experience.